This week on Newstalk 1010 I show John Moore how to grow his own Zombie Zen Garden, keep track of his expenses with his camera, and welcome Toronto-based photography community 500px to Android. 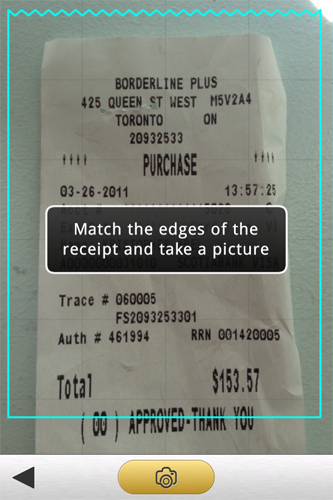 The next time you pay for something, snap a photo of the receipt and let Lemon scan it. The connected service picks out the information printed on the paper and converts it into a digital entry and keeps a running ledger for you. In this way your expenses are organized by date, payment method, purchase category (food, clothing, entertainment, etc.) and divided between business and personal accounts. 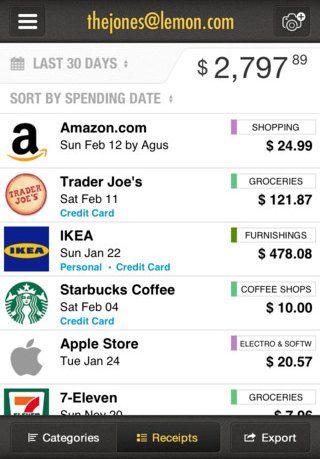 With a few taps you can bring up a graph and compare expenses by month or across different categories. The ledger as a whole can even be exported as a CSV file through e-mail or fed into other financal apps such as Expensify, Evernote, or Box. There are a number of receipt-tracking apps now, but Lemon stands out for offering unlimited free scans, support for Canadian transactions, and the inclusion of e-mail receipts as well as paper ones. You can access your ledger through their website where you can even share receipts or print out paper replacements. Beyond the free service, there’s the option to pay a monthly fee of $9 and up per month for added features such as tracking the location of stores, adding more purchase detail, and generating separate summaries that focus on taxes paid. 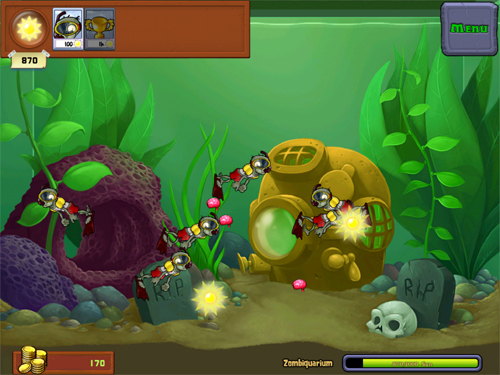 It is extraordinary the popularity enjoyed by Plants Vs. Zombies. The game earned $1 million within the first nine days of its release on the iPhone and now has fans of all ages and from all walks of life. It’s a clever premise. Your house is surrounded by the undead and to keep them at bay you must grow a garden filled with dangerous plants. From pea-shooting pods and watermelon catapults to exploding cherries and carnivorous veg, you’re given a number of cartoonish ways to deal with the goofy zombies as they shuffle across your front lawn, sometimes sporting road cones on their heads or dressed in disco suits from the 70’s. Playing the game isn’t that different from managing a store or a company. You have to monitor your supplies of seeds and sunlight, delegate different plants for specific tasks, and adapt to the changes of real-time demands from wave after wave of undead armies, many arriving with new twists that force you to keep adapting. This week the iPad version has been given a worthy update that introduces fresh variations of the game with elements from slot-machines, portal puzzles, the game bejewelled, and even one that takes place underwater. 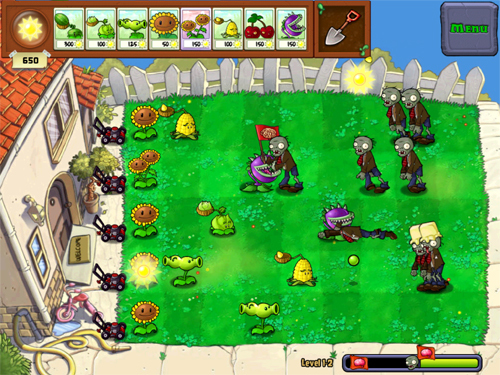 A side garden without zombies is offered to help you grow and expand the game’s supplies, making it a bit easier to unlock the game’s many upgrades. It continues to be a smartly-made and very addictive game. 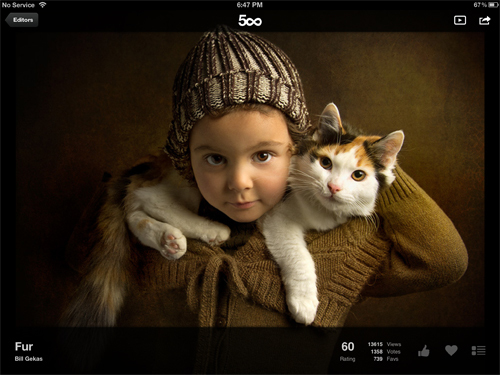 500px.com is a Toronto-based website used by professional photographers and serious shutterbugs to display their best work. Some use the site to sell high quality reproductions and prints of their pictures, but for many it’s a place to vote on and select images that represent the highest efforts in artistic photography. With the 500px app the gallery becomes an interactive art book, allowing you to swipe through images at fullscreen and in high resolution. You can explore the works chosen by editors or by popular vote and create custom photo streams based on themes or searched keywords with songs added from your own music library. If you sign up for a free account you can join in on the voting and follow specific photographers to keep up with their next submissions. 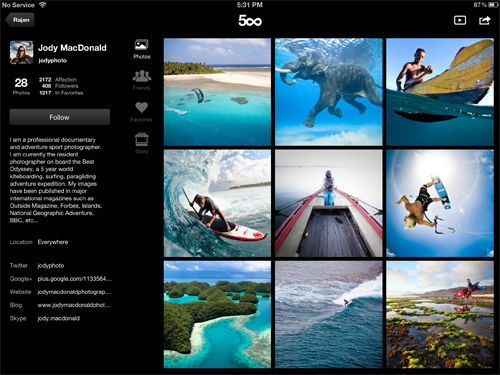 In addition to the astonishing quality of the images, 500px stands-out for its breadth of artistic styles and techniques, offering works from sports photographers, photoshop masters, street shooters, and portraitists to name just a few.